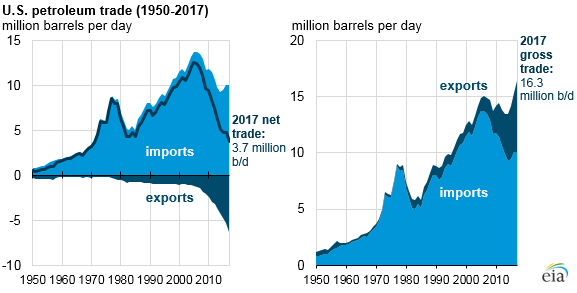 U.S. net petroleum trade, including crude oil, petroleum products, and natural gas plant liquids, has fallen in recent years, reaching 3.7 million barrels per day (b/d) in 2017. This is the lowest level of net petroleum trade (imports minus exports) since 1971. At the same time, total U.S. gross petroleum trade (imports and exports) has reached an all-time high of 16.3 million b/d in 2017. Crude oil imports have decreased in recent years as U.S. crude oil production has increased. After averaging a record high of 10.1 million b/d in 2005, crude oil imports fell by 2.8 million b/d to an average of 7.3 million b/d in 2014. Since then, crude oil imports have increased slightly, most recently averaging 7.9 million b/d in 2017. Most of the reduction in imports was light, sweet crude oil, as those barrels were replaced by domestic production of a similar quality. Crude oil exports have also increased as U.S. production rose. At the same time, U.S. refinery runs have been at record high levels. The increase in refinery output of petroleum products has outpaced the increase in U.S. consumption of petroleum products such as distillate fuel oil, gasoline, and propane, leading to an increase in exports. Total petroleum product exports averaged a record of 5.2 million b/d in 2017. Distillate and gasoline exports have increased, particularly to countries in the Western Hemisphere. Propane exports have also increased, much of it being sent to Asian markets. A series of upcoming Today in Energy articles will discuss petroleum product export trends in greater detail.